TNR -- TV News and Reviews: Cake Boss -- "Soldiers, Sand, and Salad"
Every time I think I've seen it all on Cake Boss, Buddy and his crew top themselves. Tonight, on "Soldiers, Sand, and Salad", Buddy Valastro and the Cake Boss bakers work on an FAO Schwarz-inspired cake for the birthday party of four year old twins. Buddy and the crew first go to FAO Schwarz itself to get inspired by all the toys and displays, including the famous giant piano keys featured in the film Big, and large toy soldiers made of jelly beans. Buddy makes his toy soldiers out of rice crispie treats and pound cake. 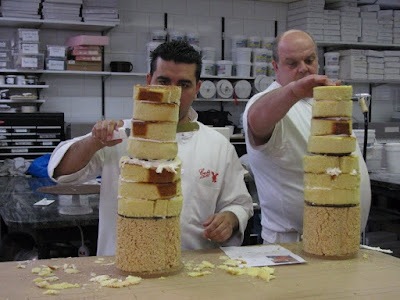 You can see in the photo above how Mauro and Buddy stacked up the cakes onto a wooden form, and glued it all together with icing to make giant towers. The Buddy carved the cake into the right form for the soldier. Next, the towers were wrapped with bands of fondant and modeling chocolate. Buddy was excited as it began to take shape and look more like soldiers. Shoes were made for the feet, little hands were molded, then cut-out fondant for eyes, nose and mustaches. Once the soldiers were complete, they were steamed, which smoothed the frosting and made it shine like toy paint. The Cake Boss crew made piano keys across the back half of the cake, while the soldeirs stood sentry at the front. Then a myriad of formed toys were added, like teddy bears, blocks, a train, cars, robots, and balloons. All these were scattered over the piano keys and at the soldiers' feet. Once again, all was steamed to make a beautiful sheen. Buddy and three of the Cake Boss boys carried the cake through FAO Schwarz, and up an escalator to the party room at the toy store. The kids were all enthralled by the display and immediately touched it--probably not realizing or believing that it was a cake and not real toys! Buddy wished the boys happy birthday and got happy thanks in return, which is always the best part of Buddy's day. The second cake of the "Soldiers, Sand, and Salad" episode was a beach scene for a beach club anniversary event. The Cake Boss crew had fun with this one, using brown sugar for sand and a colored sugary gel over icing to get the clear blue water effect for the ocean. The girls modeled beachgoers out of modeling chocolate, including a guy with a hairy chest and big sunburned belly. Buddy admired the buxom bikini-clad sunbather and said, "I think she's had some work done." When complete, the beach scene had a lifeguard, wooden planks to walk across the hot sand, sunbathers, swimmers, and sandcastles. Toys and large beach umbrellas dotted the landscape. I love that all of the Cake Boss cakes have a realistic variety of people in all shapes, colors, and sizes. When complete, it was truly and authentic version of the beach, and the partygoers absolutely loved it. The men who had commissioned the cake were overwhelmed at the detail. No matter how many great cakes we see of Buddy's, it never gets old, and he and his crew continually top themselves with creativity, elegance, and humor on a grand scale. The sideline part of this week's episode, "Soldiers, Sand, and Salad", was Buddy challenging his four sisters to a competition in weight loss. He bet that he and three of his guys would lose more weight than the girls. Buddy thought this would be an easy win for him and the Cake Boss guys, and quite frankly, I thought he'd win as well. It's a known fact that men lose weight easier and faster than women, and guys as big as Frankie can usually drop ten pounds without even breaking a sweat. Tone Tone kept track of all the numbers, and the competition was fairly decided by percentage of body weight, rather than mere poundage. As I suspected, the Cake Boss guys lost a good bit of weight, especially Frankie who dropped fifteen pounds. But to Buddy's and my surprise, the girls did just as well, and lost a full percentage point more in body weight than the guys. The girls were thrilled, especially as winning the contest meant the guys would have to work the counter downstairs at Carlo's Bakery for a full day and wait on customers. (One of the sisters also ordered Tone Tone to tear up the evidence of all their weights.) Buddy was a good sport about it, saying he was glad they'd all lost some weight to be healthier. I suspect the girls lost a lot of weight due to their extremely attractive trainer at the gym, and the Cake Boss boys didn't do as well as they caved in to cravings when dealing with all the baked goods. "It's just a biscotti," they said. "What could be in there?" Enough calories to lose a competition, apparently. Watch Cake Boss on TLC, Monday nights at 10/9c. Check your local listings for encore showings and other Cake Boss episode repeats. PHOTOS: Buddy Valastro and Mauro Castano work on the forms for the toy soldiers; Christine Campanelli carefully molds a sunbathing beauty out of modeling chocolate; Cake Boss, "Soldiers, Sand, and Salad", c2009 Libby Klein, TLC.